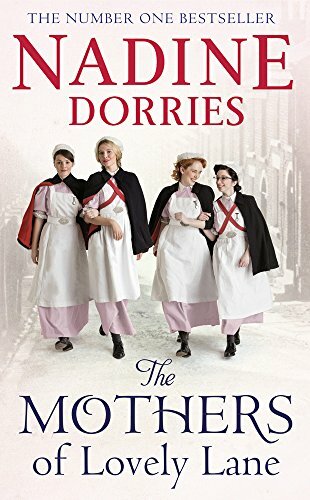 Bestselling author, Nadine Dorries draws on her Liverpool roots and her early experiences as a student nurse in the third novel starring the Angels of Lovely Lane. Nadine grew up in a working class family in Liverpool. She trained as a nurse at the age of 18. It was the only pathway open to her from the concrete housing estate and poor background she desperately wanted to escape. Having a caring nature, it was a natural career choice. Nadine has been the MP for Mid-Bedfordshire since 2005. She has three daughters. Lovely Lane is a real place in Warrington. The books combine and knit together memories of Nadine’s memories of Warrington Hospital, Lovely Lane, Bewsey Road Nurses Home, where she lived and laughed and most importantly survived and the hospitals across Liverpool where she worked. The people who have inspired this series of books most of all are the patients she nursed. Noleen Delaney is one of an army of night cleaners at St Angelus Hospital. Son, Bryan has a good job as one of the hospital’s porter’s boys, but Finn has done something unheard of and passed his Eleven Plus exam. How on earth will they pay for his books, his grammar school uniform and shoes? Bronia Ryan has battled depression since her husband died. Even in that poor neighbourhood her house is a by word for chaotic squalor. And now one son is in prison. Her youngest son, Lorcan, wants no part of a life of crime, but how can he ever escape? Or protect his mother from her vicious eldest son? As usual, St Angelus is at the heart of things. Life and death, love and loss, jealously, rivalries and betrayals are woven into a rich tapestry. I have to confess with this book, I did suffer a mid book slump. Does anyone else get this? However, once I had read another book, I did return back and completed it within a day or so. Nadine cleverly in her writing transported me back in time and placed me in to Lovely Lane where I watched the story unfold before my very eyes. It was almost as if I could touch the characters, smell the characters even. The story captured the difficulties with communities returning back to some form of normality after the war with the men returning and trying to find their place back in to society. It also reflected the great loss in people’s lives, not just with soldiers dying in the war but people dying when bombs were dropping over England. The community were slowly rebuilding their lives, however, there still was a massive scar within the community and the war in someway played a part in their lives everyday for example living with injuries or living within a stones throw of bombed out buildings. The female characters within this book are strong both physically and emotionally and almost keep the community together and look out for others, without any judgement which I only wished happened now more often. There was a strong community spirit which was overwhelming and so positive. You could feel the love and compassion which oozes out of the book. This is the first in the series I have read. But, I will be purchasing the others as I need to know what happened previously. I didn’t get the impression that you need to read the previous books to understand what is going on. Just a warning, you will go on the emotional rollarcoaster with some of the characters and you will go through a range of emotions, with one particular character, I just wanted to shout at them and tell them to pull themselves together (I don’t want to say who, as it will give away the story). At the conclusion of the book, I felt part of the community and they welcomed me into their lives. Copy of the book is available here.